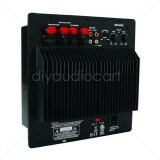 A plate amplifier is a power amplifier that is built on a flat board for installation inside of a speaker. Like any power amplifier, a plate amplifier takes line-level signals and increases their power level to be able to drive a speaker. Unlike a standard musical amplifier, many plate amps have limited frequency response, befitting their typical use as a subwoofer amplifier. Plate amplifiers typically have a face plate with inputs, outputs, controls, and a power connection, along with exposed components on their other side. They are usually designed to be mounted inside the enclosure of a subwoofer, which is a specialized speaker designed to reproduce bass and subsonic frequencies. While store-bought subwoofers include their own amplifiers, hobbyists who build their own subwoofers cut a hole in the back panel of their unit and screw the plate amplifier into it. This hides the plate's exposed components while leaving its controls and inputs available. Typically the only connections on the interior side of the plate amplifier is a pair of speaker terminals which are used to connect the amplifier's main output to the subwoofer driver.